I fell in love with my first desert before I fell in love with my first bog. That first desert was in southern California in the mid-’80s, where I (a young PhD student who had seen very little of the British Isles, let alone the world) was attending an international conference on neuroscience. I’m sure the impact that the desert had on me was all the greater for having spent the best part of a week navigating the lunacy of Disneyworld-obsessed Anaheim, and dealing with a curious sense of panicked dislocation caused by the impossibility of getting around it safely – or, sometimes, at all – on foot. I remember the first time that orange-pink shimmering landscape opened up like a flower draped around the stalk of the long straight road ahead. I remember more than anything the heart-stopping sense of freedom and possibility that seemed to unfold in the simple vastness of it – because this was the first time I’d experienced anything so radically beyond the confined and enclosed landscapes that were typical of the places I knew. I remember too the clarity and calmness that I felt, wandering for a while through that vivid uncluttered country. I went on to fall in love with other deserts, from Arizona to Alice Springs, but the memory of that one is sharper somehow, like the memories of other first loves. I fell in love with my first bog because it reminded me of the desert. I discovered it in Connemara, and the unique sense of it and how it felt to be there – the smell of the peat, the constancy of the wind and the infamously horizontal rain, the concentrated sense of mindful being in which all of the nonsense with which we clutter our heads ceased to matter and simply fell away – burrowed so deeply inside and rooted itself so strongly that two years later I had given up what remained of a stale old life and moved there, to renovate a ramshackle stone cottage in the Maamturk mountains. How can a bog possibly remind you of the desert? Because both types of landscape carry with them that same sense of space, simplicity and bleak-yet-vivid clarity. 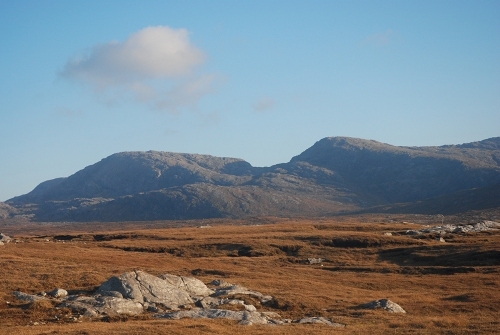 In those days, you could stand in the emptiness of certain parts of southern Connemara with nothing between you and the distant mountains but a vast expanse of flat bog moonscaped with rock. It seemed to go on forever. In place of desert: moorland. In place of sand: peat. On the surface, there doesn’t seem to be much variety in the flora and fauna of the average bog, any more than there does of the average desert – but if you believed that you’d be wrong. What life there is may be sparser and harder to find, but it’s all the more vivid for its rarity. For me, though, the finest thing about bog compared to desert is the weather. When the little of your inheritance that isn’t Scottish is Irish, and you are possessed by some wild Celtic gene that drives you always to northern and western edges of things, there’s a helpless attraction to landscapes that have been carved out of wind and rain that can’t be overcome. I’ve loved the violence of desert storms, but there’s nothing that feels as much like home to me as a little soft rain on the wind. If one mythological reflection of the desert is a wild woman dancing with skirts held high, then her Hebridean cold-weather counterpart is the Cailleach, a wild hag with blue skin who dances across the peat-skinned mountain tops bringing winter to the land. It’s for sure that she’s no lady, either. And so each day I walk (my hag-dancing days are still to come) across moors and hills and rocks that are skinned with peat, over bare Lewisian gneiss more than 3000 million years old, through a landscape characterised by the intricate scatterings of dark, shallow peat lochans that are called ‘pool systems’. But now, after five or so weeks without rain, we find that desert has come to the bog. On our headland moor, those lochans are completely dry, and the squelching boggy pools that lurk between them to trick the unwary are now nothing more than carved-out hollows in the shrunken, cracked peat. Both deer and raven have come down from the hills in search of better fare, and the late-spring flowers (tormentil, spring squill, heath milkwort, bird’s-foot trefoil …) cling desperately to yellowing scrubby grass, hoping, as we do, for rain. This entry was posted in Reflections on June 13, 2012 by Paul Scraton.